Comprehensive and simple to use keylogger for Mac OS X provides easiest methodology to record various activities performed on Apple Macintosh OS installed computer machines in complete stealth mode. So if you are using Mac machines and want spyware for mac to know what your kids, spouse, employees, students are doing on Computer system in your absence, you can use best featured and simple to operate keylogger Mac OS X program and know the complete details in easiest way. How to monitor Mac OS X using Mac monitoring software ? The salient feature of the monitoring software for mac will record all Login passwords (MySpace, Gmail, Face book, MSN, Twitter), Keystroke activities, Clipboard contents, USB drive (including Pen drive, Thumb rive, Digital camera, Mp3 player and other similar devices) insertion/removable activities, Application accesses, System/Internet activities with advance option of mac spyware to capture screenshots at regular interval of time. 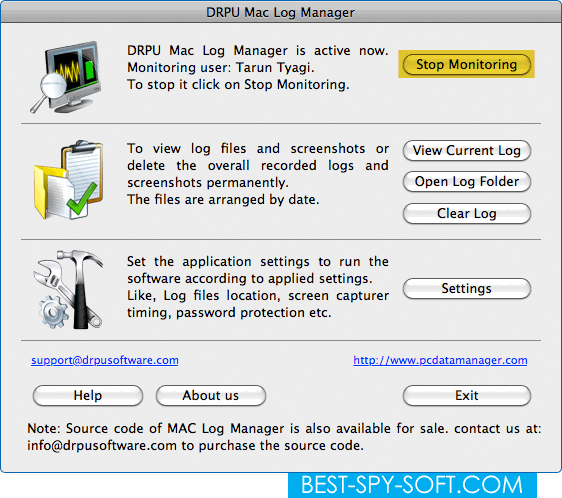 Simple to use keylogger Mac OS X software for Apple Mac OS X machines. Mac OS X keylogger records entire activities performed on computer system. Records each and every keystroke details. Records USB drive insertion and removable activities in stealth mode. Capture active picture screenshot periodically in surveillance mode. Option to capture Skype video calls screenshots at defined time intervals using mac osx keylogger. No special guidance or technical assistance required to use Apple Mac keylogger osx.